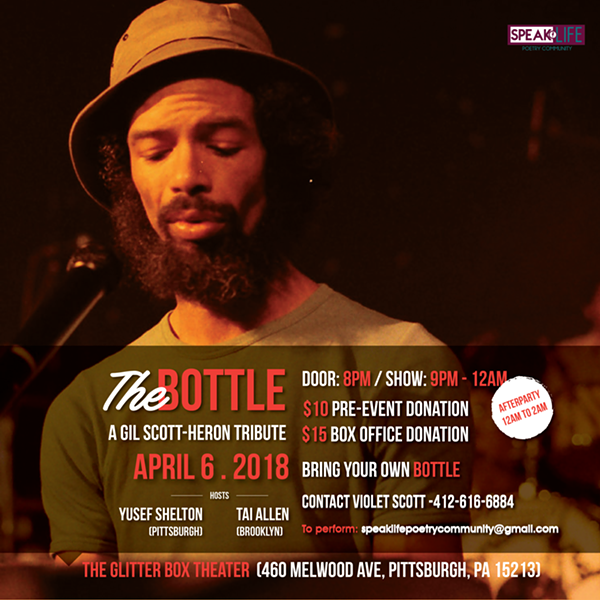 TheBottle celebrates the work of legendary activist and artist Gil Scott-Heron with a night of poetry and song, at the Glitter Box. The open mic/showcase is hosted by Tai Allen (Brooklyn, NY) & Yusef Shelton (Pittsburgh, PA). Tai Allen is currently on his book/soundtrack tour for the project No Jewels and is fresh off his performance & panel at the National Black Writers Conference. Yusef Shelton is stable, creative staple in Pennsylvania. Yusef keeps his artistry raw, authentic, and unique expressing his life experiences. As the open mic ends the partying begins via DJ Bruuh!